As soon as the first tooth appears, start brushing gently two times a day for 2-3 minutes. Use an infant-sized brush with soft, rounded bristles and just a dab of non-fluoride toothpaste. 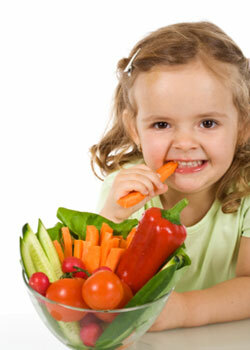 The amount of starches and sugars eaten also affect your child's dental health. Bacteria thrive on starches such as breads, pastas and chips as well as sugars such as in juices and desserts. These bacteria then attack the tooth surface, resulting in decay. Sticky foods also stay on the tooth longer, feeding bad bacteria and creating cavities. You do not need to remove all sugar and starch from the diet. For instance, milk is an important source of the calcium and it also contains sugar. Rather, you should try to limit snacking between meals and choose nutritious options. Avoid giving milk or other drinks in the bottle or sippy cup at night. Avoid nursing children to sleep or wipe teeth clean before putting them to bed. Begin weaning your child off the bottle around 1 year of age. If transitioning to a sippy cup, give only at meal and snack time and avoid "at will" use. Regular office visits (every 6 months) will allow us to diagnose and treat any problems early. Office visits also include a teeth cleaning, fluoride/varnish treatments and nutritional counseling. We may also recommend sealants. Sealants fill in the thin grooves or pits in teeth that the toothbrush cannot reach and that are particularly prone to decay. We check growth and development and may recommend an orthodontic consultation if the child's bite (occlusion) needs some adjusting. If the child has a thumb habit we may also suggest a visit to the orthodontist for a thumb sucking appliance to be placed.